The Book Garden: It's a topsy-turvy book-buying-world! Before I even owned an eReader the very idea of ever buying one felt quite unnecessary to me. Sure, it had that whole futuristic Start Trek gadget vibe working for it, but bottom line was that I saw myself as a bastion of tradition. That tradition, obviously, included the good old dead-tree-variety of reading material. Then stuff happened. Book blogging mainly. And inevitably my will lost a game of poker with my curiosity and I purchased my very first eReading device. That historical event took place a bit over three years ago and was mainly influenced by the fact that reading eGalleys on the computer screen sucked big time. What can I say? I slowly grew a liking to that little battery-powered toy and roughly a year later I was lured in by the Kindle. It made me neglect my old eReader over night. It was sleek and fast and have I mentioned yet all those amazing eBook deals on Amazon? So the spell had been broken. Or rather my decision to read the printed word the way it had been done for centuries, by flipping papery pages, underwent some revision. Of course, at first I read both kind of books, but slowly I noticed that I read a lot more of what I had downloaded on my Kindle than diminishing the unread book stacks which had started to accumulate even more dust now than ever. This tells you a lot about how much I loathe household chores as well as where my loyalties have apparently shifted to over night. Some years back I would have scoffed at the very idea, now I've decided to even kick the formerly thrifty used-book-buying to the curb and resort to feeding my Kindle instead. Some of you might wonder why and frankly, it's quite simple. Space. I've grown averse to cluttered spaces and as wonderful as bookshelves with pretty book spines may be, once you start cramming books into boxes, storing them in every available space in the apartment, the whole bookish ambiance suffers. Cost. Being quite the frugal reader I've mostly bought used books through AwesomeBooks in recent years. Now that they've cancelled free shipping for international orders the average price of a book almost equals what you'd pay for the eBook. Convenience. Downloading an eBook takes mere seconds. And reselling English books is the drag where I live. No one seems to want them, not even for a buck a piece. From here on out I shall (mostly, anyway) buy eBooks. Who would have thought I'd ever end up a proponent of no-tree-died-for-that books? That makes me wonder whether I should add environmental friendly to the list above. After all, no tree logs running down to the mill. However, I have no idea about the impact scrapped eReaders might have on the environment. There's a thought for another day (and possibly another blog post). 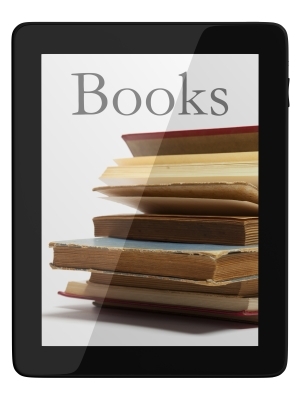 What kind of books do you mostly buy - hard copies or eBooks? What influences your decision whether to go paper or digital and which of the two do you personally prefer? Please share. I'm split roughly 50-50, but I also check out a lot of books from the library, overwhelmingly physical, but some digital. I'm with you though, I think once I clear off my shelves I'll probably stick closer to the Kindle which is great! I like to hold an actual book. I love the smell of the paper and the feel of a book in my hands. I too check out books from my library and I have a second hand bookstore in my city that I also get books. Having said this, I have to admit that lately I have been watching others who have ereaders some type of tablet and I am starting to think it may be time to try out an ereader myself. I would definitely miss holding a book and turning pages too, but out of necessity (=lack of space) buying eBooks is sort of a last resort for me. Frankly, I don't think I will ever give up reading "real" books, but I'm equally fond of my Kindle. Trust me it's nothing like reading on a computer and so far my eyes had no complaints. Of course sometimes I wish I had the room for a home library, because then I would go all back to print books too. After all, it'd be a sad sight if there were only a Kindle sitting on one shelf of a big library, right? I haven't really browsed much on AwesomeBooks lately, because of the new shipping fee. I can only hope that TBD won't start charging fees either, but who knows? Not to say I don't understand it, after all international shipping isn't cheap and they need to make a profit somehow, but oh well.